For a Socialist Republic of United Kurdistan! Down with the Ban on the PKK! The imperialist-organized kidnapping of Abdullah Öcalan, leader of the Kurdish nationalist PKK (Kurdistan Workers Party), has now claimed new victims. 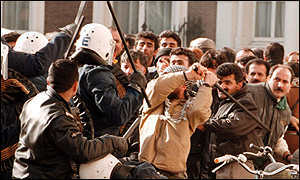 While Öcalan is held on a prison island, facing the death penalty at the hands of the Turkish military butchers who have slaughtered tens of thousands of Kurds and laid waste to their land, in Germany Kurdish demonstrators are shot down in cold blood and arrested by the hundreds. Kurdish pro-testers are now threatened with deportation to the torture chambers in Turkey. Down with the racist deportations! The workers movement must fight for full citizenship rights for immigrant workers and their families. The urgency of this demand is underlined by the looming possibility of a strike in the metal industry, with its key component of immigrant workers. At the same time the SPD/Green government of German imperialism is gearing up to join in a NATO military occupation of Kosovo. Already there are several thousand Bundeswehr soldiers in Bosnia. The peoples of Yugoslavia still recall vividly the devastation wrought by the occupation by the German Wehrmacht in World War II. Every class-conscious worker must demand: Germany/U.S. /UN/NATO out of the Balkans! While decreeing that Kurdish protests have no place on “German soil,” the SPD/Green government has under-lined its continuity with the Kohl regime by maintaining the ban on the PKK and various Kurdish cultural associations, as well as Turkish leftist organizations like Devrimci Sol. As cops moved against PKK supporters in a dozen German cities with clubs and water-cannon, the Turkish military continues the genocidal slaughter in Kurdistan with helicopters and tanks provided courtesy of German imperialism. The Turkish refusal to let international observers and Öcalan’s lawyers into the country makes a mockery of the prating by Schröder, Schily and Green Foreign Minister Fischer about a “fair trial" for Öcalan. Despite its hypocritical airs of noninvolvement the Schröder government is complicit in the international manhunt against Öcalan. Down with the ban on the PKK and all other Kurdish nationalist organizations! Down with the ban on Devrimci Sol! The Kurdish protests come at a time when the racist hysteria over “dual citizenship” for immigrants in Germany has called into question the cynical sop of the SPD/Green bill . This offered only crumbs for a tiny minority of long-time residents on the condition of continued racist terror on the borders. Now, in the wake of its defeat in the Hesse state elections, the Schröder government – supported by the PDS (Party of Democratic Socialism) – is backpedaling. Simultaneously there has been a new outbreak of murderous fascist violence in the town Guben on the Polish border, as an Algerian immigrant was chased to his death. The bourgeois media vituperates against Kurdish “terrorists” in German streets. The [right-wing] Springer press (Die Welt) laments that it was Israelis who pulled the trigger – they wanted German police to stage the bloodbath on German soil. Yet the Kurdish protesters were unarmed and included children. The occupations of embassies (and several cases of self-immolation) were acts of desperation of a brutally oppressed people. They were answered by murderous state repression. While revolutionary Marxists call for the liberation of Abdullah Öcalan and stand on the side of the PKK in its military confrontation with the Turkish state, we are irreconcilably politically opposed to the bourgeois nationalism of the PKK. It is urgently necessary to fight for the unity of Kurdish, Turkish and German workers in common class struggle. The rash of attacks on Turkish snack bars, restaurants and cultural groups is indefensible and undercuts this perspective by indiscriminately targeting all Turks rather than the blood-drenched Turkish capitalist state. As the imperialist bourgeoisies push the lie of the “death of communism,” Öcalan liquidated the PKK’s leftist verbiage and desperately sought an imperialist patron as guarantor of a bogus “autonomy” for the Kurds in Turkey. In Germany this even took the form of an approach to the sinister reactionary Christian Democratic politician Lummer. *** But Öcalan was not to be rewarded with the status of an Arafat or a Mandela for all this. Instead he was delivered up into the hands of his pursuers. The bourgeois media in Germany worries that the “Kurdish problem” remains unresolved, despite (they hope) the decapitation of the PKK. It is true that there will be no peace in Kurdistan. The de facto U.S. protectorate in north Iraq is a dead-end for the Kurdish masses, as the nationalists of the PUK and KDP squabble over the meager spoils of their precarious control over this zone. For its part, U.S. imperialism wants the Turkish regime at its side against Saddam Hussein, as it steps up its bombing raids in a drive to install a more pliant neo-colonialist regime in Iraq. US/UN/NATO hands off Iraq! Break the starvation embargo! For a socialist republic of united Kurdistan! This is the only answer to the dismemberment of the Kurdish nation by the bourgeois regimes of the Near East, and it collides head-on with the interests of all the imperialist powers in “stabilizing” the region. Yet from Istanbul to Tel Aviv to Teheran these regimes show increasing signs of crisis. The Trotskyist program of revolutionary internationalist class struggle can unite Turkish and Kurdish toilers, Hebrew-speaking and Arab workers, the multinational proletariat of Iran, for socialist revolution against imperialism. For a socialist federation of the Near East! The capitalist “New World Order” means massive attacks on the working class, racist terror and deepening imperialist rivalries as the oppression of working people in the semicolonial countries in intensified. It is necessary to fight for socialist revolution internationally, from the Near East to the imperialist citadels of Europe. The League for the Fourth International is dedicated to forging the revolutionary party of the international proletariat to carry out this task. * Interior minister of the SPD government that crushed the German Revolution 1918-19. Known for his statement that "someone has got to be the bloodhound," Gustav Noske instigated the murder of Communist leaders Rosa Luxemburg and Karl Liebknecht. **The PDS, social-democratic heirs of the Stalinist rulers of the East German deformed workers state, for the first time since capitalist reunification of Germany in 1990 entered a state government following elections last fall. *Former state interior minister, notorious for brutal attacks on leftists and immigrants by fascist-infested Berlin cops and auxiliary police.